At the start of the new year, many set goals or make resolutions to improve their lives. A poll showed around 68 percent of the people who set goals for themselves stuck with them for at least part of the year. KANSAS CITY, Mo. — An estimated 40 percent of Americans will make resolutions for the new year. Many of those goals will help certain businesses boom this January. "As people look at what they want out of the new year, they think 'I want less stress.' One way to get that is to make your home work for you," said Joanie Nicholas, owner of All Things Organized . Nicholas practices what she preaches at her home, where you can find things like an alphabetically-organized spice rack and office drawers divided with perfectly-sized containers. For more than 20 years, she has helped others streamline their lives. Many clients ring her phone for help in the new year. "When you have somebody objective come in and somebody who can kind of lead you through that process, then it does go a lot quicker. It's a lot easier, it's more fun," Nicholas said. She's not the only one fielding calls in January. 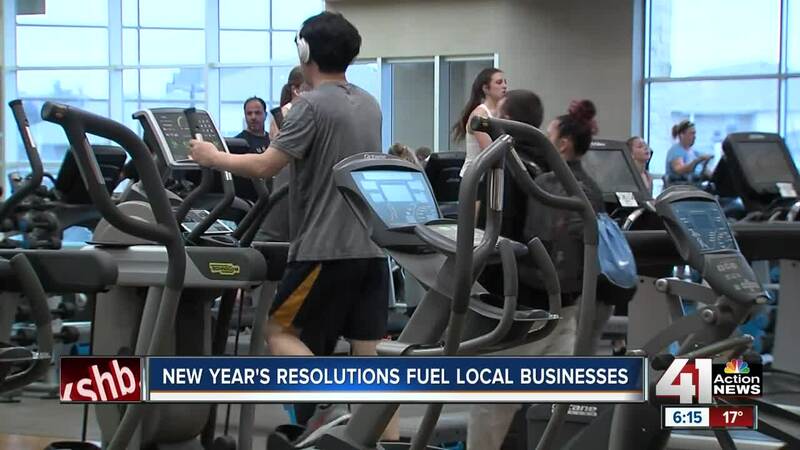 "Yesterday we had 40 new folks join....and that's a pretty large number," said Greg Gilbertsen, Overland Park Lifetime Fitness General Manager. When you add the numbers from New Year's Eve and Jan. 1, the fitness center gained about 60 new members. Gilbertsen said tackling a health resolution can be overwhelming at first. "Really how do I get started, and what's the right path? That's usually the biggest opportunity, is for them to overcome that thought process," he explained. Believe it or not, Nicholas said success on the treadmill can also depend on the state of your home. "If you want to lose weight and exercise, another big resolution, well you better have a closet where you can find your gym bag and your workout clothes," she said. Organization can also tie into healthy eating, according to Nicholas. You can engineer a kitchen where it's easier to grab healthy food and to cook at home.